And so another family situation comedy is born. And another. And another. And . . . . . Suddenly, there comes a switch. The father isn’t a bumbler. Instead, he’s a normal, intelligent businessman controlling his family sensibly, even wisely. The laughs aren’t yocks; they’re chuckles and smiles-warm ones. 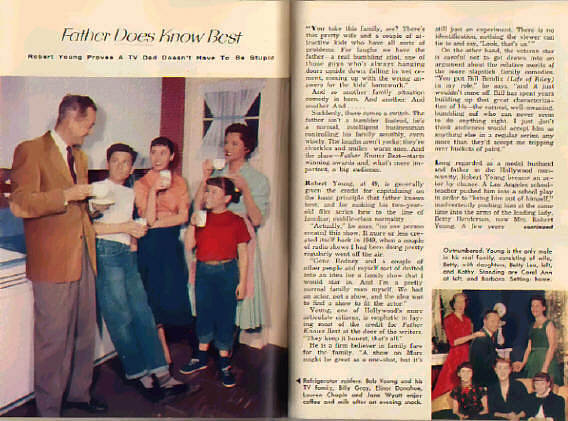 And the show-Father Knows Best-starts winning awards and, what’s more important, a big audience.Robert Young, at 49, is generally given the credit for capitalizing on the basic principle that father knows best; and for making his two-year-old film series hew to the line of familiar, middle-class normality. “Actually,” he says, “no person created this show. It more or less created itself back in 1949, when a couple of radio shows I had been doing pretty regularly went off the air. One the other hand, the veteran star is careful not to get drawn into an argument about the relative merits of the more slapstick family comedies. “You put Bill Bendix (Life of Riley) in my role,” he says, “and it just wouldn’t come off. Bill has spent years building up that great characterization of his-the earnest, well-meaning, bumbling oaf who can never seem to do anything right. I just don’t think audiences would accept him as anything else in a regular series, any more than they’d accept me tripping over buckets of paint.”Long regarded as a model husband and father in the Hollywood community, Robert Young became an actor by chance. A Los Angeles school teacher pushed him into a school play in order to “bring him out of himself,” inadvertently pushing him at the same time into the arms of the leading lady, Betty Henderson, now Mrs. Robert Young. A few years later his high school dramatics teacher pulled Young out of the bank where he worked and insisted that he appear in a play at the Pasadena Playhouse. He subsequently did dozens. Spoted by an agent, Young found himself one day supporting a hopeful actress in an M-G-M screen test. 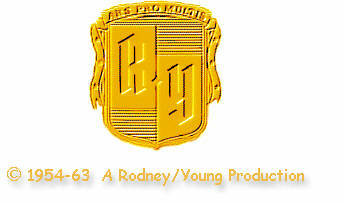 He was little more than a moving prop, but a studio executive apparently liked the way he moved, and Young was launched on a career of romancing everyone on the M-G-M payroll. That was 25 years ago. Young’s four daughters, ranging in age from 11 to 22, have always occupied a good deal of his time, although he frequently finds himself “outfought and outmaneuvered” when up against the odds of five women against one lone man. Tall and lean almost to the point of thinness, he has kept himself in good trim by a constant battle with a high golf score. Since 1947, he has been a private-plane enthusiast, flying at least once a month to the family farm in Carmel Valley. The farm is now up for sale, however, the children having pretty well outgrown its rural appeal; and he and his wife are looking forward to “semi-retirement” at a smaller place they recently bought near LaJolla. More recently, asked to pose for a gag picture, Young amiably refused. “I don’t like gag pictures,” he said. “They may seem funny at the moment, but they get printed a million times and become nauseating.” The picture wasn’t taken. Father still knows best.